Updated February 14, 2018, at 2:30 p.m. to correct the date of the tariff approval. Solar photovoltaic (PV) module imports into the United States have increased significantly in recent years and represent a sizable portion of installed solar capacity. In 2016, U.S. imports of solar modules measured in direct current (DC) totaled 13 gigawatts (GWDC)—up from 2 GWDC in 2010—with two-thirds of 2016 imports coming from Malaysia, China, and South Korea. Import capacity is reported in direct current because it reflects the panel capacity, while operating capacity in the United States is reported as it is delivered to the grid in alternating current (AC). Because of losses associated with converting DC to AC, capacity values reported in AC typically are 10% to 30% lower than those reported in DC capacity. The United States installed 8 GWAC of utility-scale solar PV in 2016 and another 3 GWAC of small-scale solar capacity. That amount was roughly equivalent to about 14 GW of DC capacity, meaning many of the PV systems installed in 2016 probably used imported panels when adjusted for DC-to-AC conversion losses. In January 2018, the United States approved safeguard tariffs on imported silicon solar cells and modules. Solar cells are the individual units or wafers that convert sunlight directly into electricity, while a collection of interconnected cells in a sealed package is referred to as a module or panel. Solar panels are installed in arrays, or rows of panels, that—along with other hardware like an inverter—make up an installation. The import tariffs will apply for the next four years, starting at 30% of the cell or module price and declining each year by 5 percentage points until reaching 15% in the fourth year. The first 2.5 GWDC of imported unassembled solar cells will be exempt from the safeguard tariff each year, but these represent a small fraction of what is imported into the United States. U.S. solar imports include all types of PV modules—including crystalline silicon, thin film, and concentrator types—although most systems installed in the United States are crystalline silicon. Panel chemistries other than crystalline silicon are not affected by the tariff. The International Trade Commission (ITC) instituted the cases for solar PV tariffs in May 2017 after two global solar manufacturers headquartered in the United States, Suniva and SolarWorld, petitioned for import relief through Section 201 of the Trade Act of 1974. Previous trade restrictions have been used in the past to address imports of solar cells and modules. In 2012, the ITC issued orders to place duties on PV cells manufactured in China. In 2014, the ITC issued new tariffs for PV cells manufactured in China and Taiwan. These previous anti-dumping and countervailing duties targeted specific countries, but the more recent tariffs affect nearly all major sources of PV imports. After 2014, some manufacturing companies located in China and Taiwan outsourced their production to other countries not covered by the anti-dumping duties. As a result, the United States began to see increased imports primarily from Malaysia, as well as from South Korea, Singapore, and Germany. Solar PV modules only represent a portion of the total equipment—which includes the inverter and other hardware—required to install a solar PV system. Soft costs, which include labor, permitting, inspection, and interconnection, also add to the system cost. The U.S. Department of Energy’s National Renewable Energy Laboratory estimates that the module portion of total installed costs ranged from 22% for residential systems to 45% for fixed-axis utility-scale systems in 2016. The price for PV modules has fallen by nearly 40% since 2012. In 2012, the average module price in the United States was $1.15 per watt ($/WDC). In 2016, the average price was $0.72/WDC, based on data collected by EIA. 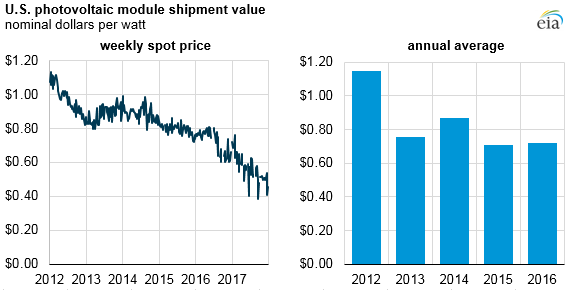 In addition, the global spot price for solar modules continued to decline through 2017, suggesting a further decline in the average U.S. imports price for 2017. At the start of 2017, the global spot price for monocrystalline solar modules were about $0.72/WDC, and by the last week of December 2017 the spot price was $0.45/WDC.